Make your morning beautiful with a freshly brewed coffee and drank from this splendid hand made painted mug. It will energize your day! Peace,Love & Serenity to All. The four clay artists in the show demonstrate exciting visions and the many approaches of working with clay. Andrew Snyder makes his dynamic canvases in the exhibit while throwing on the wheel. Hhis movements be they slow or fast, nervous or relaxed are registered by the clay splatters falling on the fabric covered floor. The splatters are left to dry and then the fabric is stretched like canvas. 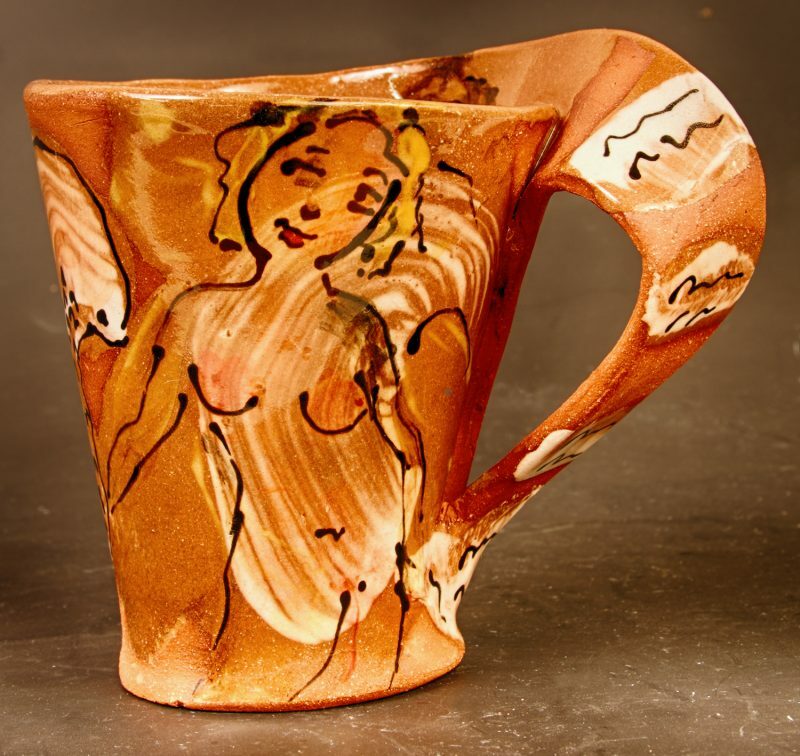 With other works he stretched sheer fabric or lace and dips them into unfired glaze half way. These poetical images are like a record of past experiences. Rachel Eng is interested in the finite nature of all things. She makes beautiful tone on tone clay bas-reliefs. This textural work is pulsating with life as if seen from high altitudes. Unfired and unglazed, thee work is installed outside on the ground and left to the vagaries of rain and wind. Bryan Hopkins deals in contractditions. He uses porcelain, a refined material, and then proceeds to negate this frailty by texturing it with coarse materials and using rough construction methods. He then tortures it by firing the work in reduction to a very high temperature. These powerful vessels exude strength and are in direct contrast with the delicate celadon glaze on top. Quite a feat. Mark Erroll does functional work, mugs, bowls, plates, vases and others. They become intimate objects as they are meant to be used everyday. He treats his forms as canvases and decorates them with delightful patterns and narrative visions. Call 610-869-4712 or email to set up a visit, or, if you are driving by and see cars outside, just drop in. If you are far away, and can’t visit in person, we do visits by Skype – email us to set up a virtual visit.